Title text: I had some important research to do on proposed interstellar space missions, basketball statistics, canceled skyscrapers, and every article linked from "Women in warfare and the military in the 19th century." This is indeed good news. It means I have a jet! Or the web. One or the other. Last edited by Soupspoon on Mon Oct 09, 2017 2:54 pm UTC, edited 1 time in total. 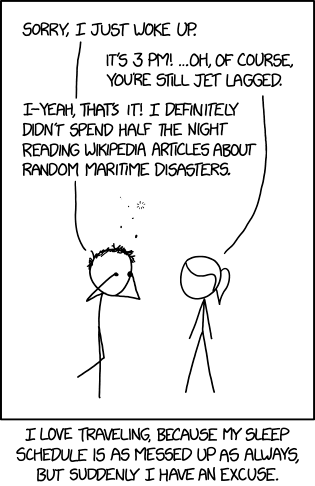 Reminds me of The Problem with Wikipedia, which was one of the first XKCDs I remember reading. Also, I think it should be 1900, rather than 1990. Which reminds me of the time I got knocked out of my classroom spelling bee by spelling "bankroll" as "b-a-n-k-r-o-o-l". Double-letter recognition, but wrong placement. I prefer random maritime disasters to scheduled maritime disasters, though the latter can be easier to avoid. keithl wrote: I prefer random maritime disasters to scheduled maritime disasters, though the latter can be easier to avoid. I think I prefer the scheduled ones. They can be fun to watch if the ship explodes before sinking. The problem isn't with his[my] sleep cycle, it's with the fact that Earth has been taken over by Vile Morning People. They're the ones who call you lazy/messed up/bad if you don't like to get up in the morning, but consider it somehow virtuous to go to bed before it gets dark at night. What I need is to move to Barrayar, or a similar planet with a 28-hour day. No, because my boss is a card-carrying Vile Morning Person who likes to micro-manage to boot. Reka wrote: The problem isn't with his[my] sleep cycle, it's with the fact that Earth has been taken over by Vile Morning People. They're the ones who call you lazy/messed up/bad if you don't like to get up in the morning, but consider it somehow virtuous to go to bed before it gets dark at night. What you Owls perhaps don't appreciate is that we Larks feel the same in reverse. The world is run by evil night people who insist on having enjoyable things happen late at night and consider us to be boring spoilsports with no life if we want to go to bed at midnight or 11pm because we got up before midday. It's also, at risk of a massive derail, part of the reason why we need daylight saving. Every year I try to stay on daylight saving (BST) for a few weeks after the clocks go back, since the mornings are still quite light. But it fails as soon as I go out in the evening because I have to switch to the new time to fit with everyone else. "Everyone can just get up an hour earlier"? Yeah, right. ETA: It's probably true that owlism might be detrimental to your employment prospects, but larkism reduces your prospects for finding a mate, so it's swings and roundabouts. We're most likely to meet a romantic partner at work or at afternoon events like weddings - maybe early evenings at a pinch. At nightclubs and late night parties we're going to be performing well below our best. The obvious solution is to wake up early AND stay up late. AND get a full night's sleep so that you're at your best during the day. Pfhorrest wrote: The obvious solution is to wake up early AND stay up late. The real solution is non-24-hour sleep-wake disorder. If you're interested, you may be able to semi-permanently induce it in yourself by exposing yourself to omnipresent bluish-green light 24 hours a day for a few weeks. I usually get up at midnight and sleep at 4pm. This is easy because I have no friends. Sleeping in (i.e., getting up at 3am) is nice in the summer because the sun is up. I don't understand why people get jetlagged, or rather I do, it's because they refuse to go to sleep at a sensible time (even if you can't fall asleep). A sensible time to go to sleep is 9pm. In my younger single days, I used to go to bed between 1am and 2am, and get up for work at half 7, during the week. Then at the weekend I slept until between noon and 2pm on Saturday and Sunday, which seemed to balance out the lack of sleep in the previous 5 days. A quarter of a century later I think that lifestyle would kill me. I always thought that an odd turn of phrase... to me "half 7" should mean "halfway to seven", or 6:30. But as I understand it, it means "seven and a half" or 7:30. Maybe the seven is jetlagged. ucim wrote: to me "half 7" should mean "halfway to seven", or 6:30. It's just short for "half past seven". With a half, it's always "past" (in English), so that can be elided. Note that we don't say "quarter seven", which would be ambiguous. Most Brits are familiar with the American language from movies and TV (or films and telly, as we call them), and are pretty much bilingual. But for some reason, it must be rare for people to discuss times in the movies, because it always confuses me when somebody says something like "five of seven". I think it must mean "five to seven", i.e. 6.55, because 7.05 would be "five after seven" which is pretty unambiguous. There's a number of languages that has half-to notation, which accept things like "five past half (to) three" as 14:35 (assuming PM, naturally), and maybe "five to half (to) three" for thirty-five to the hour, over twenty-five past the prior one. At least archaically. orthogon wrote: Most Brits are familiar with the American language from movies and TV (or films and telly, as we call them), and are pretty much bilingual. But for some reason, it must be rare for people to discuss times in the movies, because it always confuses me when somebody says something like "five of seven". I think it must mean "five to seven", i.e. 6.55, because 7.05 would be "five after seven" which is pretty unambiguous. As an American myself, I don't know if I've ever heard "five of seven" used to refer to a time (I always hear/use the same to/after language you're used to). In my opinion, "five of seven" appropriately refers only to the integer 35 (and "half of seven" will always be 3.5). Five of seven, tertiary adjunct to unimatrix zero. speising wrote: Five of seven, tertiary adjunct to unimatrix zero. I always thought of it as an adjunct to seven of nine. ETA: maybe it's "off", and I'm hearing it wrong, or it's become "of" by erosion over time. I'm pretty sure I've heard the "x of y" to mean "x until y" usage before, but to my (Californian) ear it has kind of an upper-class, east-coast, actually kinda British sound to it. Hungarian too, probably not coincidentally. Soupspoon wrote: There's a number of languages that has half-to notation, which accept things like "five past half (to) three" as 14:35 (assuming PM, naturally), and maybe "five to half (to) three" for thirty-five to the hour, over twenty-five past the prior one. At least archaically. Okay, that sounded pretty mad, but then I realised I could say öt perccel múlt fél három1 and it wouldn't sound weird. ETA: That actually works for any number of minutes up to maybe even ten and also in the opposite direction, Tíz perc múlva háromnegyed három2 would also work for the same time. The odd bit there is that "three quarters three" means it is three quarter hours past two (or quarter to three, if you will). Does any other language use "three quarters" at all when talking about time? ETA2: 1 "five minutes past half to three"
2"ten minutes to quarter to three"
somitomi wrote: Does any other language use "three quarters" at all when talking about time? Yes, this manner of expressing times is widespread (though not universal) in German. "Dreiviertel drei" (literally: three quarters three) means quarter to three, or 2:45. So that probably came from German too. I always thought it would make more sense for "half 7" to mean "3:30"
"Half seven, PM" could be 09:30..
Eoink wrote: In my younger single days, I used to go to bed between 1am and 2am, and get up for work at half 7, during the week. Then at the weekend I slept until between noon and 2pm on Saturday and Sunday, which seemed to balance out the lack of sleep in the previous 5 days. A quarter of a century later I think that lifestyle would kill me. At 32, I do that to this very day, if not worse. I'm usually up 'till a bit after 2, sometimes after 3, and get up around 7:20 (with an aux alarm at 7:45) for work. On the weekends I try to sleep in as much as I can get away with, usually 'till 11 to 3, depending. There are also semi-disasterous events that involve Kerbal Space Program or Stellaris (Or heck, even Civ), when I'm up until after 4 or 5. It's curious how much misery a couple of extra hours can induce. Around here, it is usually the hour that is dropped. "Ten to", or "Quarter past", where the hour being referred to was mentioned earlier in the conversation. Elsewise, it will be a straight-forward "Twelve-fourty-two". The cost/benefit ratio between a syllable or two vs dramatically improved precision and clarity seems pretty lopsided. SuicideJunkie wrote: Around here, it is usually the hour that is dropped. "Ten to", or "Quarter past", where the hour being referred to was mentioned earlier in the conversation. Elsewise, it will be a straight-forward "Twelve-fourty-two". I don’t think that’s all that uncommon — I mean, everybody in my family does it, and some other people I know both back home and here at college (in another state) do it. I have noticed it tends to be more common among older people than younger people. Personally, I don’t have a big problem with it — probably because I’m used to it. Most datetimes are given in a relative or implicit way: "at 3 o'clock", "on Wednesday", "on the 17th", "in December", etc. "Ten to" is just another example. A time you often hear is "seven thirty-eight", which seems surprisingly precise until you realise that the person is actually saying "7.30 /8” as opposed to its homophone "7.38".